Looking for a way to spend an afternoon while waiting to embark on your next epic cruise? Trying to beat the heat and have some quality family time? Come be blown away at Florida’s Museum of Discovery and Science in Ft Lauderdale, Florida. Ft Lauderdale offers many things for visitors looking for variety and excitement. The Museum of Discovery and Science Reviews are full of diversity in subject matter, hands on learning and interactive adventures. From nature enthusiast to wannabe jet pilots, guaranteed to be something memorable for all who enter. Highlights from this landmark destination on the east coast of the sunshine state are just the beginning. There is so much to be a part of, a multiday pass is barely enough to experience it all, for a local, the way to go, is the annual pass. The Museum of Discovery and Science offers groundbreaking 7D multi sensory theater. Have the urge to try and land an Air Bus A380 or hit mach 1 in your very own FA-18 Blue Angel? Can do, just climb in and take control, its amazing. Climb in to the simulation capsule and become encompassed in a reality all your own. Take a trip to Mars and control the rover. Experience the red planet as if you were there. The Museum of Discovery and Science reviews a real life Everglade experience. See, feel and be a part of the diverse nature that Florida offers. Walk away with a deeper understanding of the wildlife, fauna and natural setting that is the Everglades. Stop in the new Eco Discovery center; a massive learning and hands on discovery area that will amaze and impress anyone who visits. From Bones to Stones, the special exhibits are always unique and eye opening. The Everglades Airboat Adventure will take you to the edge of your seat while literally blowing your hair back, as real as it gets. Next up, the Museum of Discovery and Science Eco Discovery Center offers a chance to watch Otters at Play. Leaving your kids in smiling and in awe of the Otter life. Want to Step in to hurricane force winds and safely return? The Storm Center exhibit allows you to understand the intense and destructive forces of nature and live to tell the tale. When its time to sit back and relax, The iMax theater is state of the art. It instantly infuses you into the action. The 6 story high screen overwhelms your senses, while seated comfortably in the stadium seats. Whether you are watching a Hollywood classic or the newest iMax production, your entire being will be engaged, fully. 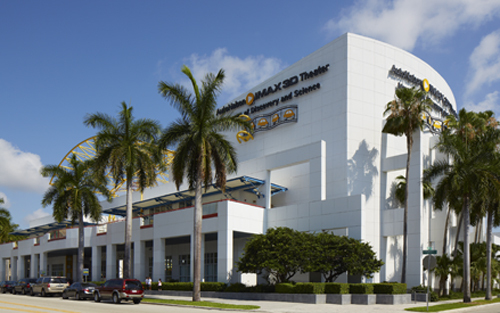 The Museum of Discovery and Science is reason enough to visit Ft. Lauderdale. The gift store offers take home interactive products and gifts. This, as well, should not be missed.